With all the excitement of Christmas approaching, it's no surprise that Marley, the lovable pup with a nose for trouble, wants to get in on the action. Anticipating his very first snowfall and Santa's arrival, Marley jumps in to help his family every way he can. But Marley, being Marley, always ends up on the wrong side of right. It's not long before he tears down the twinkle lights, attacks a chain of paper snowflakes, and mistakes the Christmas tree for . . . well . . . his very own indoor bathroom. Will Marley's good intentions ruin everything before Christmas begins? Or will he manage to share some Christmas magic with his family after all? This follow-up to the #1 bestselling Bad Dog, Marley! delivers a heartfelt holiday story with many hilarious Marley mishaps along the way. 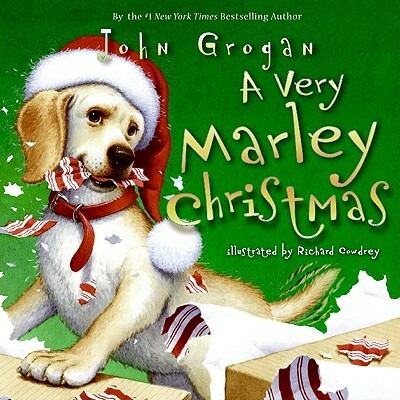 John Grogan is the author of the #1 international bestseller Marley & Me: Life and Love with the World's Worst Dog, the bestselling middle-grade memoir Marley: A Dog Like No Other, and three #1 best-selling picture books: Bad Dog, Marley!, A Very Marley Christmas, and Marley Goes to School. John lives with his wife and their three children in the Pennsylvania countryside. John Grogan ha sido un premiado reportero gráfico y columnista por más de veinticinco años. Vive en Pensilvania con su esposa Jenny y sus tres hijos. Richard Cowdrey has illustrated numerous books for children, including Bad Dog, Marley! by John Grogan, Animal Lullabies by Pam Conrad, and Frosty the Snowman by Steve Nelson and Jack Rollins. He is the owner of a yellow Labrador, Murray, whose behavior is remarkably similar to Marley's. He lives in Ohio with his wife and children.